Another installment in our series of posts where Texas Tree Surgeons answers your tree questions. Are you having problems with your trees and want to know what’s wrong? Let us know! There are some mushrooms growing up my tree’s trunk. Is that bad? As we’ve mentioned before, all this rain has really been a mixed blessing. While we are happy to be safely out of drought conditions, many issues that we don’t see in drier weather have started presenting themselves. Fungi, which thrive in moist environments, have been growing rapidly, sometimes seeming to appear overnight. 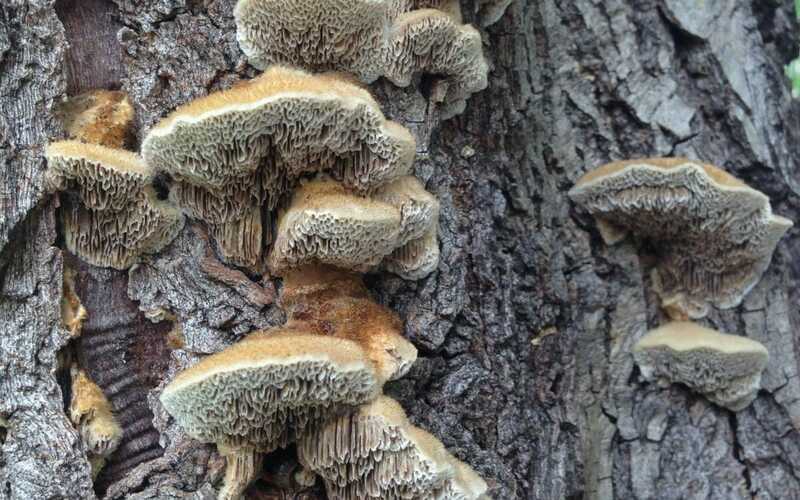 While a few toadstools in your yard may not indicate a serious problem, visible fungal growth on trees is something to be on the lookout for and may need to be addressed. There are a wide variety of different fungal species that can live in the soil around trees. Some are beneficial, and are part of a healthy soil ecosystem. Others, however, can spread through a tree’s living tissue and cause health problems for the tree. We have seen problems with Chinese pistaches recently that are caused by a proliferation of fungi due to the wet weather. In the past few years, Italian cypresses have also been afflicted with health issues due to the spreading of a particular fungus. In both these cases, there were little or no warning signs or visible “mushroom” growth before the trees started browning and dying back. However, there are some fungal infections that exhibit visible growths and can be diagnosed before the tree is too far gone. The fungus Kretzschmaria deusta is a common cause of root rot. Hackberries are a North Texas tree species that is often susceptible to infection by Kretzschmaria. When fruiting in the spring, Kretzschmaria fungi appear gray or white, and may be confused with lichen. As they mature through the year, however, the fungal growths darken and can be harder to see. At any time of the year, black or gray growth near the base of a hackberry is a typical sign of a Kretzchmaria infection. With Kretzschmaria, as with many fungi, looks can be deceiving, as even a small area of visible growth can indicate an extensive underground presence. 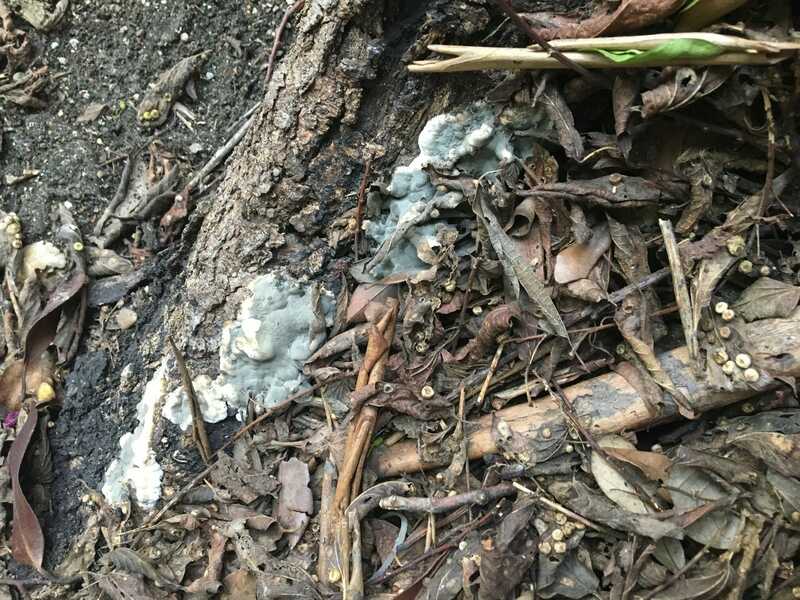 If you see evidence of fungal activity at the base of a tree, the root system may already be infected to the point of structural failure, and the tree can be at risk of falling. A certified arborist can properly diagnose a Kretzschmaria infection and discuss options for dealing with the infected tree. Unfortunately, there is no treatment for Kretzschmaria, and an infected tree usually must be removed. It is possible to perform a root zone excavation and examine the extent of damage, but the tree will have come down eventually. It is better to remove a tree safely before it falls on its own. Kretzschmaria is always present in the soil, and can infect a tree when there is root or trunk damage. Even a small cut in the bark can be an entry point for the microscopic fungal spores, so it is important to take care when displacing soil or doing landscaping work around a tree. Proper mulching in the critical root zone is a good way to protect the tree from bark damage. The tell-tale gray and white of Kretzschmaria deusta. The black on the tree trunk was a Kretzschmaria infection that weakened the root system and caused this tree to fall in a storm. Ganoderma is the name of a genus of fungi, and there are several different species that are present in the environment. While the different species vary in appearance, the ones commonly seen in North Texas generally mature into ear-shaped growths called “conks.” The conks may appear on a tree trunk, near the base, or even grow right out of the ground. The conks begin as white- or light-colored, but darken into dark orange or brown with a shiny appearance on top. Oaks and elms are particularly susceptible to Ganoderma, but other species can become infected, as well. Ganoderma, like Kretzschmaria, is present in the soil, and infects a tree when its roots become damaged and lose their protective bark. While Ganoderma is similarly untreatable, it can be easier to detect in its early stages and may be able to be managed, avoiding immediate removal. Root zone excavation can also be helpful in determining the extent of damage. Ganoderma conks can sprout from the ground where the infected root material is close to the surface. While Kretzschmaria and Ganoderma can cause serious tree stability and health problems, not all visible fungi are a hazard. Fungi in the genus Laetiporus (such as sulfur shelf or chicken of the woods mushrooms) can live on a tree trunk for years without harming the tree. Common white toadstools, such as those in the genus Lepiota, may appear in lawns as a result of beneficial fungal growth in the soil. In periods of heavy rain, species that are usually hidden underground may show visible growths. 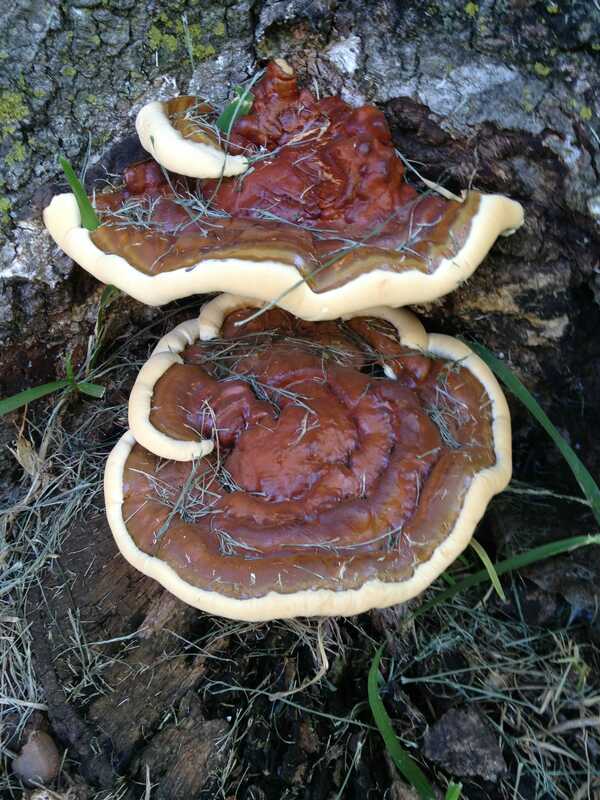 If you see mushrooms or other fungal growth in your yard or on your tree, send us a photo, and we are happy to let you know if it’s something to be worried about. We love trees and we love our customers, and we always want to help you understand the complex ecology of our urban forest. Have a specific tree question? Let us know, and you may see it answered in a future Ask Texas Tree Surgeons installment!